Brewers Complete Sweep of Pirates ~ The Bucky Channel - The World of Sports from Wisconsin's Perspective. So this J.J Hardy guy is pretty good, isn't he? Hardy has been known to be a streaky hitter in the past, but they way he's hitting now I think we should all just enjoy the ride. The shortstop followed up his snapped 16 game hitting streak by hitting 2 home runs as well as a double, as the Brewers beat Pittsburgh 11-6. The Brewers got things going early with a 4 run first inning, and it looked like this game was in the bag early. Pittsburgh, to their credit, rallied for 6 unanswered runs and made things interesting. But the Brewers had the sweep in their sights, and kept piling the runs on the scoreboard. All-Star starter Ryan Braun added a home run, but doubles were all the rage today. 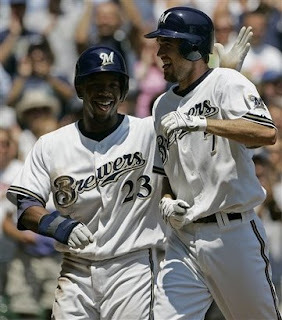 Hart and Hall each had two, Fielder added another, as did Kendall, Weeks, Braun and Hardy. Mike Cameron was the only starter not to collect a hit today. While it looks like the Sabathia deal is in fact happening, the question now is which starter will lose their spot in the rotation? It won't happen, but right now Jeff Suppan is pitching worse than anyone on that staff right now. He went just three innings, as Yost decided the bullpen was rested enough to carry the team the rest of the way. He turned out to be right, as Stetter picked up the win, and Riske, Mota, and Shouse also pitched well. By the way, the Brewers are getting Sabathia!! !